. : Tuesday Morning Strength with Carleton :: Ski XCOttawa.ca :: Skiing in Ottawa and Gatineau Park :. Strength training is a critical part of a skier’s fitness, contributing to power, sprinting ability, and all sorts of other important aspects of racing. For those of us on XCOttawa who are also students are Carleton, one of the best ways to get our strength training in is with the Carleton team. After all, doing strength alone is not nearly as fun as it is doing it with twenty other skiers! Every Tuesday, the Carleton team congregates at the varsity weight room at 7:15am, ready for the traditional Carleton strength circuit. 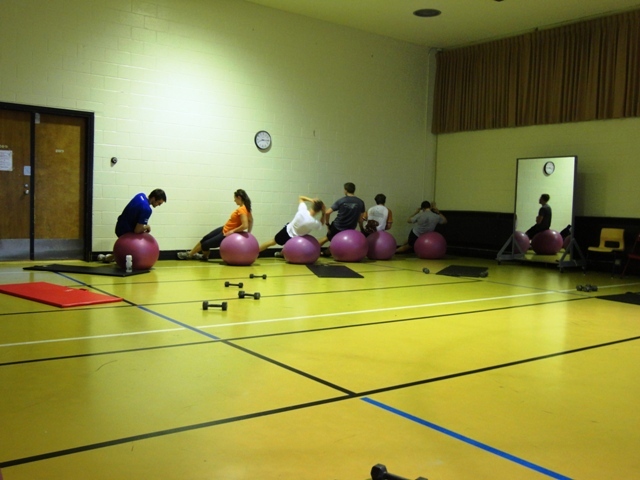 This circuit involves medicine balls, weights, rollerboards, and pretty much anything else that the gym has to offer! Pull-ups? Not a problem for Kyla! 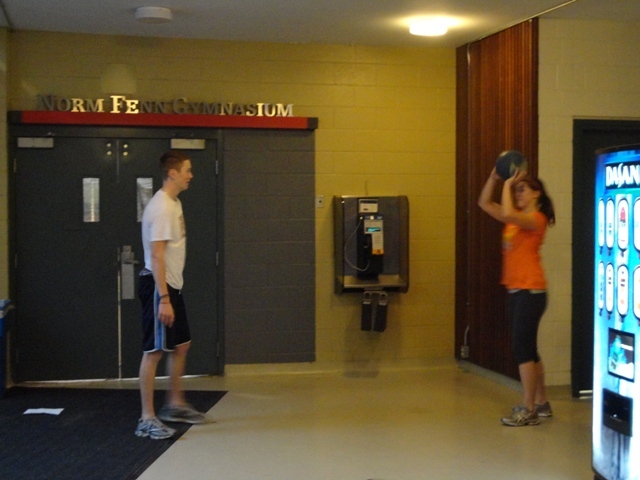 Peter and Emma doing the one-arm medicine ball toss. 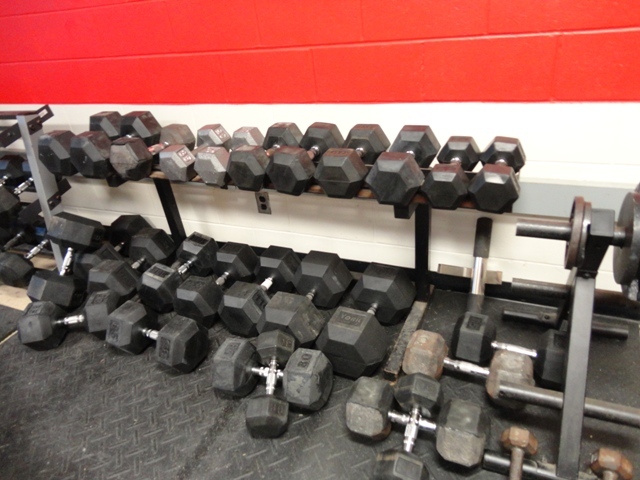 Good thing Carleton has provided us with 100lb+ weights. After the 40 minute circuit, the team heads upstairs for another half hour of core and leg exercises, using exercise balls and free weights. This is always capped off by each member choosing an exercise to do, sometimes leading to competitions to see who can cause the most pain. 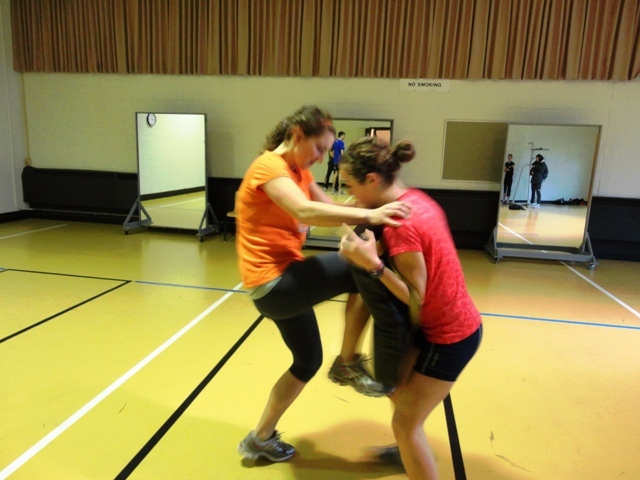 Recently, we’ve decided to take out some of the martial arts padding after the core, to step up our self-defence or fighting skills. While this has very little to do with strength training, it always adds some excitement and entertainment at the end of practice. Here, Emma takes on Holly. I wouldn’t mess with her on the trails this winter! Once the strength is over, most of the team goes out for a cool-down run, while the not-so-lucky ones trudge off to 8:30am class. Personally, I find sitting in an early class much better after having spent a better part of the morning training. Watch out for some strong XCOttawa and Carleton skiers at the races this winter! Sheila's Nutrition Digest: Sheila's Nutrition Digest Vol. 9 - Food Psychology: What is controlling your eating?